Liquid chromatography–mass spectrometry (LC-MS) is an analytical chemistry technique that combines the physical separation capabilities of liquid chromatography (or HPLC) with the mass analysis capabilities of mass spectrometry (MS). 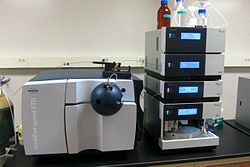 Coupled chromatography - MS systems are popular in chemical analysis because the individual capabilities of each technique are enhanced synergistically. While liquid chromatography separates mixtures with multiple components, mass spectrometry provides structural identity of the individual components with high molecular specificity and detection sensitivity. This tandem technique can be used to analyze biochemical, organic, and inorganic compounds commonly found in complex samples of environmental and biological origin. Therefore, LC-MS may be applied in a wide range of sectors including biotechnology, environment monitoring, food processing, and pharmaceutical, agrochemical, and cosmetic industries. In addition to the liquid chromatography and mass spectrometry devices, an LC-MS system contains an interface that efficiently transfers the separated components from the LC column into the MS ion source. The interface is necessary because the LC and MS devices are fundamentally incompatible. While the mobile phase in a LC system is a pressurized liquid, the MS analyzers commonly operate under vacuum (around 10−6 torr). Thus, it is not possible to directly pump the eluate from the LC column into the MS source. Overall, the interface is a mechanically simple part of the LC-MS system that transfers the maximum amount of analyte, removes a significant portion of the mobile phase used in LC and preserves the chemical identity of the chromatography products (chemically inert). As a requirement, the interface should not interfere with the ionizing efficiency and vacuum conditions of the MS system. Nowadays, most extensively applied LC-MS interfaces are based on atmospheric pressure ionization (API) strategies like electrospray ionization (ESI), atmospheric pressure chemical ionization (APCI), and atmospheric pressure photo-ionization (APPI).These interfaces became available in the 1990s after a two decade long research and development process. The coupling of chromatography with MS is a well developed chemical analysis strategy dating back from the 1950s. Gas chromatography (GC) - MS was originally introduced in 1952, when A.T. James and A.J.P Martin were trying to develop tandem separation - mass analysis techniques. In GC, the analytes are eluted from the separation column as a gas and the connection with electron ionization (EI) or chemical ionization (CI) ion sources in the MS system was a technically simpler challenge. Because of this, the development of GC-MS systems was faster than LC-MS and such systems were first commercialized in the 1970s. The development of LC-MS systems took longer than GC-MS and was directly related to the development of proper interfaces. V.L. Tal'roze and collaborators started the development of LC-MS in the early 1970s, when they first used capillaries to connect LC columns and MS ion sources. A similar strategy was investigated by McLafferty and collaborators in 1973. This was the first and most obvious way of coupling LC with MS, and was known as the capillary inlet interface. This pioneer interface for LC-MS had the same analysis capabilities of GC-MS and was limited to rather volatile analytes and non-polar compounds with low molecular mass (below 400 Da). In the capillary inlet interface, the evaporation of the mobile phase inside the capillary was one of the main issues. Within the first years of development of LC-MS, on-line and off-line alternatives were proposed as coupling alternatives. In general, off-line coupling involved fraction collection, evaporation of solvent, and transfer of analytes to the MS using probes. Off-line analyte treatment process was time consuming and there was an inherent risk of sample contamination. Rapidly, it was realized that the analysis of complex mixtures would require the development of a fully automated on-line coupling solution in LC-MS. The moving-belt interface (MBI) was developed in 1977. This interface consisted of an endless moving belt receiving the LC column effluent. On the belt, the solvent was evaporated by gently heating and efficiently exhausting the solvent vapors under reduced pressure in two vacuum chambers. After removing the liquid phase, the analytes would desorb from the belt and migrate to the MS ion source to be analysed. MBI was successfully used for LC-MS applications between 1978 and 1990 because it allowed coupling of LC to MS devices using EI, CI, and fast-atom bombardment (FAB) ion sources. The most common MS systems connected by MBI interfaces to LC columns were magnetic sector and quadropole instruments. MBI interfaces for LC-MS allowed MS to be widely applied in the analysis of drugs, pesticides, steroids, alkaloids, and polycyclic aromatic hydrocarbons. This interface is no longer used because of its mechanical complexity and the difficulties associated to belt renewal. Particle beam interfaces took over the wide applications of MBI for LC-MS in 1988. The direct liquid introduction (DLI) interface was developed in 1980. This interface was thought as a solution to the evaporation of liquid inside the capillary inlet interface. In DLI, a nebulizer was used to disintegrate part of the effluent coming from the column. A small diaphragm was used to form a liquid jet composed of small droplets that were subsequently dried in a desolvation chamber. A microbore capillary column was used to transfer the nebulized liquid product to the MS ion source. The analytes were ionized using a solvent assisted chemical ionization source, where the LC solvents acted as reagent gases. To use this interface, it was necessary to split the flow coming out of the LC column because only a small portion of the effluent (10 to 50 μl/min out of 1 ml/min) could be analyzed on-line without breaking the MS vacuum. One of the main operational problems of the DLI interface was the frequent clogging of the diaphragm orifices. The DLI interface was used between 1982 and 1985 for the analysis of pesticides, corticosteroids, metabolites in equine urine, erythromycin, and vitamin B12. However, this interface was replaced by the thermospray interface, which removed the flow rate limitations and the issues with the clogging diaphragms. The thermospray (TSP) interface was developed in 1983 by Vestal laboratories at the University of Houston. The interface resulted from a long term research project intended to find a LC-MS interface capable of handling high flow rates (1 ml/min) and avoiding the flow split in DLI interfaces. The TSP interface was composed by a heated probe, a desolvation chamber, and an ion exchange skimmer. The LC effluent passed through the heated probe and emerged as a jet of vapor and small droplets flowing into the desolvation chamber at low pressure. The ionization of solutes occurred by direct evaporation or ion-molecule reactions induced by the solvent. This interface was able to handle up to 2 ml/min of eluate from the LC column and would efficiently introduce it into the MS vacuum system. TSP was also more suitable for LC-MS applications involving reversed phase liquid chromatography (RT-LC). The TSP system had a dual function acting as an interface and a solvent-mediated chemical ionization source. With time, the mechanical complexity of TSP was simplified, and this interface became popular as the first ideal LC-MS interface for pharmaceutical applications comprising the analysis of drugs, metabolites, conjugates, nucleosides, peptides, natural products, and pesticides. The introduction of TSP marked a significant improvement for LC-MS systems and was the most widely applied interface until the beginning of the 1990s, when it began to be replaced by interfaces involving atmospheric pressure ionization (API). The frit FAB and continuous flow-FAB (CF-FAB) interfaces were developed in 1985 and 1986 respectively. Both interfaces were similar, but they differed in that the first used a porous frit probe as connecting channel, while CF-FAB used a probe tip. From these, the CF-FAB was more successful as a LC-MS interface and was useful to analyze non-volatile and thermally labile compounds. In these interfaces, the LC effluent passed through the frit or CF-FAB channels to form a uniform liquid film at the tip. There, the liquid was bombarded with ion beams or high energy atoms (fast atom). For stable operation, the FAB based interfaces were able to handle liquid flow rates of only 1-15 μl and were also restricted to microbore and capillary columns. In order to be used in FAB MS ionization sources, the analytes of interest should be mixed with a matrix (e.g., glycerol) that could be added before or after the separation in the LC column. FAB based interfaces were extensively used to characterize peptides, but lost applicability with the advent of electrospray based interfaces in 1988. Liquid chromatography is a method of physical separation in which the components of a liquid mixture are distributed between two immiscible phases, i.e., stationary and mobile. The practice of LC can be divided into five categories, i.e., adsorption chromatography, partition chromatography, ion-exchange chromatography, size-exclusion chromatography, and affinity chromatography. Among these, the most widely used variant is the reverse-phase (RP) mode of the partition chromatography technique, which makes use of a non-polar (hydrophobic) stationary phase and a polar mobile phase. In common applications, the mobile phase is a mixture of water and other polar solvents (e.g., methanol, isopropanol, and acetonitrile), and the stationary matrix is prepared by attaching long-chain alkyl groups (e.g., n-octadecyl or C18) to the surface of irregularly or spherically shaped 5 μm diameter silica particles. In HPLC, typically 20 μl of the sample of interest are injected into the mobile phase stream delivered by a high pressure pump. The mobile phase containing the analytes permeates through the stationary phase bed in a definite direction. The components of the mixture are separated depending on their chemical affinity with the mobile and stationary phases. The separation occurs after repeated sorption and desorption steps occurring when the liquid interacts with the stationary bed. The liquid solvent (mobile phase) is delivered under high pressure (up to 400 bar or 300.000 torr) into a packed column containing the stationary phase. The high pressure is necessary to achieve a constant flow rate for reproducible chromatography experiments. Depending on the partitioning between the mobile and stationary phases, the components of the sample will flow out of the column at different times. The column is the most important component of the LC system and is designed to withstand the high pressure of the liquid. Conventional LC columns are 100–300 mm long with outer diameter of 6.4 mm (1/4 inch) and internal diameter of 3.0-4.6 mm. For applications involving LC-MS, the length of chromatography columns can be shorter (30–50 mm) with 3-5 μm diameter packing particles. In addition to the conventional model, other LC columns are the narrow bore, microbore, microcapillary, and nano-LC models. These columns have smaller internal diameters, allow for a more efficient separation, and handle liquid flows under 1 ml/ min (the conventional flow-rate). In order to improve separation efficiency and peak resolution, ultra performance liquid chromatography (UPLC) can be used instead of HPLC. This LC variant uses columns packed with smaller silica particles (~1.7 μm diameter) and requires higher operating pressures in the range of 310.000 to 775.000 torr (6000 to 15000 psi). 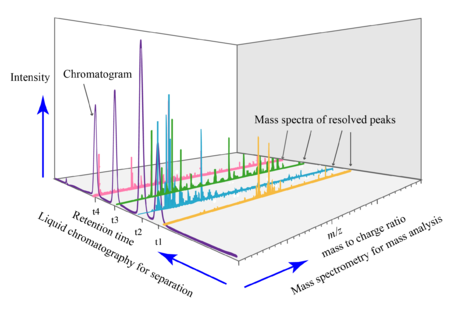 Mass spectrometry (MS) is an analytical technique that measures the mass-to-charge ratio (m/z) of charged particles (ions). Although there are many different kinds of mass spectrometers, all of them make use of electric or magnetic fields to manipulate the motion of ions produced from an analyte of interest and determine their m/z. The basic components of a mass spectrometer are the ion source, the mass analyzer, the detector, and the data and vacuum systems. The ion source is where the components of a sample introduced in a MS system are ionized by means of electron beams, photon beams (UV lights), laser beams or corona discharge. In the case of electrospray ionization, the ion source moves ions that exist in liquid solution into the gas phase. The ion source converts and fragments the neutral sample molecules into gas-phase ions that are sent to the mass analyzer. While the mass analyzer applies the electric and magnetic fields to sort the ions by their masses, the detector measures and amplifies the ion current to calculate the abundances of each mass-resolved ion. In order to generate a mass spectrum that a human eye can easily recognize, the data system records, processes, stores, and displays data in a computer. The mass spectrum can be used to determine the mass of the analytes, their elemental and isotopic composition, or to elucidate the chemical structure of the sample. MS is an experiment that must take place in gas phase and under vacuum (1.33 * 10−2 to 1.33 * 10−6 pascal). Therefore, the development of devices facilitating the transition from samples at higher pressure and in condensed phase (solid or liquid) into a vacuum system has been essential to develop MS as a potent tool for identification and quantification of organic compounds and peptides. MS is now in very common use in analytical laboratories that study physical, chemical, or biological properties of a great variety of compounds. Among the many different kinds of mass analyzers, the ones that find application in LC-MS systems are the quadrupole, time-of-flight (TOF), ion traps, and hybrid quadrupole-TOF (QTOF) analyzers. The interface between a liquid phase technique (HPLC) with a continuously flowing eluate, and a gas phase technique carried out in a vacuum was difficult for a long time. The advent of electrospray ionization changed this. Currently, the most common LC-MS interfaces are electrospray ionization (ESI), atmospheric pressure chemical ionization (APCI), and atmospheric pressure photo-ionization (APPI). These are newer MS ion sources that facilitate the transition from a high pressure environment (HPLC) to high vacuum conditions needed at the MS analyzer. Although these interfaces are described individually, they can also be commercially available as dual ESI/APCI, ESI/APPI, or APCI/APPI ion sources. Various deposition and drying techniques were used in the past (e.g., moving belts) but the most common of these was the off-line MALDI deposition. A new approach still under development called direct-EI LC-MS interface, couples a nano HPLC system and an electron ionization equipped mass spectrometer. ESI interface for LC-MS systems was developed by Fenn and collaborators in 1988. This ion source/ interface can be used for the analysis of moderately polar molecules (e.g., metabolites, xenobiotics, and peptides). The liquid eluate coming out of the LC column is pumped through a metal capillary kept at 3 to 5 kV. The liquid is nebulized at the tip of the capillary and a fine spray of charged droplets is formed. To avoid contamination, this capillary is usually perpendicularly located at the inlet of the MS system. The heat created by the electric potential is used to rapidly evaporate the droplets in an atmosphere of dry nitrogen. Later, the ionized analytes are transferred into the high vacuum chamber of the MS as the charged ions flow through a series of small apertures with the aid of focusing voltages. Positively and negatively charged ions can be detected and it is possible to switch between the negative and positive modes of operation. Most ions produced in the ESI interface are multiply charged. The use of 1–3 mm ID microbore columns is recommended for LC-MS systems using electrospray ionization (ESI) interfaces because optimal operation is achieved with flow rates in the 50-200 μl/min range. The development of the APCI interface for LC-MS started with Horning and collaborators in the early 1973. However, its commercial application was introduced at the beginning of the 1990s after Henion and collaborators improved the LC-APCI-MS interface in 1986. The APCI ion source/ interface can be used to analyze small, neutral, relatively non-polar, and thermally stable molecules (e.g., steroids, lipids, and fat soluble vitamins). These compounds are not well ionized using ESI. In addition, APCI can also handle mobile phase streams containing buffering agents. The liquid from the LC system is pumped through a capillary and there is also nebulization at the tip, where a corona discharge takes place. First, the ionizing gas surrounding the interface and the mobile phase solvent are subject to chemical ionization at the ion source. Later, these ions react with the analyte and transfer their charge. The sample ions then pass through small orifice skimmers by means of or ion-focusing lenses. Once inside the high vacuum region, the ions are subject to mass analysis. This interface can be operated in positive and negative charge modes and singly-charged ions are mainly produced. APCI ion source can also handle flow rates between 500 and 2000 μl/min and it can be directly connected to conventional 4.6 mm ID columns. The APPI interface for LC-MS was developed simultaneously by Bruins and Syage in 2000. APPI is another LC-MS ion source/ interface for the analysis of neutral compounds that cannot be ionized using ESI. This interface is similar to the APCI ion source, but instead of a corona discharge, the ionization occurs by using photons coming from a discharge lamp. In the direct-APPI mode, singly charged analyte molecular ions are formed by absorption of a photon and ejection of an electron. In the dopant-APPI mode, an easily ionizable compound (Dopant) is added to the mobile phase or the nebulizing gas to promote a reaction of charge-exchange between the dopant molecular ion and the analyte. The ionized sample is later transferred to the mass analyzer at high vacuum as it passes through small orifice skimmers. The coupling of MS with LC systems is attractive because liquid chromatography can separate delicate and complex natural mixtures, which chemical composition needs to be well established (e.g., biological fluids, environmental samples, and drugs). Further, LC-MS has applications in volatile explosive residue analysis. Nowadays, LC-MS has become one of the most widely used chemical analysis techniques because more than 85% of natural chemical compounds are polar and thermally labile and GC-MS cannot process these samples. As an example, HPLC-MS is regarded as the leading analytical technique for proteomics and pharmaceutical laboratories. Other important applications of LC-MS include the analysis of food, pesticides, and plant phenols. LC-MS is widely used in the field of bioanalysis and is specially involved in pharmacokinetic studies of pharmaceuticals. Pharmacokinetic studies are needed to determine how quickly a drug will be cleared from the body organs and the hepatic blood flow. MS analyzers are useful in these studies because of their shorter analysis time, and higher sensitivity and specificity compared to UV detectors commonly attached to HPLC systems. One major advantage is the use of tandem MS-MS, where the detector may be programmed to select certain ions to fragment. The measured quantity is the sum of molecule fragments chosen by the operator. As long as there are no interferences or ion suppression, the LC separation can be quite quick. LC-MS is used in proteomics as a method to detect and identify the components of a complex mixture. The bottom-up proteomics LC-MS approach generally involves protease digestion and denaturation using trypsin as a protease, urea to denature the tertiary structure, and iodoacetamide to modify the cysteine residues. After digestion, LC-MS is used for.peptide mass fingerprinting, or LC-MS/MS (tandem MS) is used to derive sequence of individual peptides. LC-MS/MS is most commonly used for proteomic analysis of complex samples where peptide masses may overlap even with a high-resolution mass spectrometry. Samples of complex biological (e.g., human serum) may be analyzed in modern LC-MS/MS systems, which can identify over 1000 proteins. However, this high level of protein identification is possible only after separating the sample by means of SDS-PAGE gel or HPLC-SCX. LC-MS has emerged as one of the most commonly used technologies in global metabolite profiling of biological tissue (e.g. blood plasma, serum, urine). LC-MS is also used for the analysis of natural products and the profiling of secondary metabolites in plants. In this regard, MS-based systems are useful to acquire more detailed information about the wide spectrum of compounds from a complex biological samples. LC-Nuclear magnetic resonance (NMR) is also used in plant metabolomics, but this technique can only detect and quantify the most abundant metabolites. LC-MS has been useful to advance the field of plant metabolomics, which aims to study the plant system at molecular level providing a non-biased characterization of the plant metabolome in response to its environment. The first application of LC-MS in plant metabolomics was the detection of a wide range of highly polar metabolites, oligosaccharides, amino acids, amino sugars, and sugar nucleotides from Cucurbita maxima phloem tissues. Another example of LC-MS in plant metabolomics is the efficient separation and identification of glucose, sucrose, raffinose, stachyose, and verbascose from leaf extracts of Arabidopsis thaliana. LC-MS is frequently used in drug development because it allows quick molecular weight confirmation and structure identification. These features speed up the process of generating, testing, and validating a discovery starting from a vast array of products with potential application. LC-MS applications for drug development are highly automated methods used for peptide mapping, glycoprotein mapping, natural products dereplication, bioaffinity screening, in vivo drug screening, metabolic stability screening, metabolite identification, impurity identification, quantitative bioanalysis, and quality control. ^ Chaimbault, Patrick (2014-01-01). "The Modern Art of Identification of Natural Substances in Whole Plants". In Jacob, Claus; Kirsch, Gilbert; Slusarenko, Alan; Winyard, Paul G.; Burkholz, Torsten (eds.). Recent Advances in Redox Active Plant and Microbial Products. Springer Netherlands. pp. 31–94. doi:10.1007/978-94-017-8953-0_3. ISBN 9789401789523. ^ a b c d e f g h i j k Dass, Chhabil (2007-01-01). "Hyphenated Separation Techniques". Fundamentals of Contemporary Mass Spectrometry. John Wiley & Sons, Inc. pp. 151–194. doi:10.1002/9780470118498.ch5. ISBN 9780470118498. ^ a b c d e f g h i j Pitt, James J (2017-03-12). "Principles and Applications of Liquid Chromatography-Mass Spectrometry in Clinical Biochemistry". The Clinical Biochemist Reviews. 30 (1): 19–34. ISSN 0159-8090. PMC 2643089. PMID 19224008. ^ a b c d e f g h i j k l m n Niessen, Wilfried M. A (2006). Liquid Chromatography-Mass Spectrometry, Third Edition. Boca Raton: CRC Taylor & Francis. pp. 50–90. ISBN 9780824740825. OCLC 232370223. ^ James, A. T.; Martin, A. J. P. (1952-03-01). "Gas-liquid partition chromatography: the separation and micro-estimation of volatile fatty acids from formic acid to dodecanoic acid". Biochemical Journal. 50 (5): 679–690. doi:10.1042/bj0500679. ISSN 0264-6021. PMC 1197726. PMID 14934673. ^ Tal'roze, V.L. ; Gorodetskii, I.G. ; Zolotoy, N.B; Karpov, G.V. ; Skurat, V.E. ; Maslennikova, V.Ya. (1978). "Capillary system for continuous introducing of volatile liquids into analytical MS and its application". Adv. Mass Spectrom. 7: 858. ^ a b c d e Ardrey, Robert E. (2003-01-01). "Introduction". Liquid Chromatography – Mass Spectrometry: An Introduction. Analytical Techniques in the Sciences (AnTS). John Wiley & Sons, Ltd. pp. 1–5. doi:10.1002/0470867299.ch1. ISBN 9780470867297. ^ Roberts, Gordon (2013). Encyclopedia of Biophysics - Springer. doi:10.1007/978-3-642-16712-6. ISBN 978-3-642-16711-9. ^ Sharp, Thomas R. (2009-01-01). "Mass Spectrometry". In Nassar, Ala F.; Collegiateessor, Paul F. Hollenberg; VP, JoAnn Scatina (eds.). Drug Metabolism Handbook. John Wiley & Sons, Inc. pp. 167–227. doi:10.1002/9780470439265.ch8. ISBN 9780470439265. ^ Arpino, Patrick (1992). "Combined liquid chromatography mass spectrometry. Part III. Applications of thermospray". Mass Spectrometry Reviews. 11 (1): 3–40. Bibcode:1992MSRv...11....3A. doi:10.1002/mas.1280110103. ^ Arpino, Patrick (1989). "Combined liquid chromatography mass spectrometry. Part I. Coupling by means of a moving belt interface". Mass Spectrometry Reviews. 8 (1): 35–55. Bibcode:1989MSRv....8...35A. doi:10.1002/mas.1280080103. ^ Murray, Kermit K. (1997). "Coupling matrix-assisted laser desorption/ionization to liquid separations". Mass Spectrometry Reviews. 16 (5): 283–299. Bibcode:1997MSRv...16..283M. doi:10.1002/(SICI)1098-2787(1997)16:5<283::AID-MAS3>3.0.CO;2-D.
^ Cappiello, Achille; Famiglini, Giorgio; Palma, Pierangela; Pierini, Elisabetta; Termopoli, Veronica; Trufelli, Helga (2008-12-01). "Overcoming Matrix Effects in Liquid Chromatography−Mass Spectrometry". Analytical Chemistry. 80 (23): 9343–9348. doi:10.1021/ac8018312. ISSN 0003-2700. PMID 19551950. ^ Cappiello, Achille; Famiglini, Giorgio; Mangani, Filippo; Palma, Pierangela (2002-03-01). "A simple approach for coupling liquid chromatography and electron ionization mass spectrometry". Journal of the American Society for Mass Spectrometry. 13 (3): 265–273. doi:10.1016/S1044-0305(01)00363-4. ISSN 1044-0305. PMID 11908806. ^ Fenn, J. B.; Mann, M.; Meng, C. K.; Wong, S. F.; Whitehouse, C. M. (1989-10-06). "Electrospray ionization for mass spectrometry of large biomolecules". Science. 246 (4926): 64–71. Bibcode:1989Sci...246...64F. CiteSeerX 10.1.1.522.9458. doi:10.1126/science.2675315. ISSN 0036-8075. PMID 2675315. ^ Horning, E. C.; Horning, M. G.; Carroll, D. I.; Dzidic, I.; Stillwell, R. N. (1973-05-01). "New picogram detection system based on a mass spectrometer with an external ionization source at atmospheric pressure". Analytical Chemistry. 45 (6): 936–943. doi:10.1021/ac60328a035. ISSN 0003-2700. ^ Robb, null; Covey, null; Bruins, null (2000-08-01). "Atmospheric pressure photoionization: an ionization method for liquid chromatography-mass spectrometry". Analytical Chemistry. 72 (15): 3653–3659. doi:10.1021/ac0001636. ISSN 1520-6882. PMID 10952556. ^ Widmer, Leo; Watson, Stuart; Schlatter, Konrad; Crowson, Andrew (2002). "Development of an LC/MS method for the trace analysis of triacetone triperoxide (TATP)". The Analyst. 127 (12): 1627–1632. doi:10.1039/b208350g. ISSN 0003-2654. ^ a b Sudhakar, P.; Latha, P.; Reddy, P. V. (2016-04-05). Phenotyping Crop Plants for Physiological and Biochemical Traits. Academic Press. ISBN 9780128041109. ^ Gika, Helen G.; Theodoridis, Georgios A.; Plumb, Robert S.; Wilson, Ian D. (January 2014). "Current practice of liquid chromatography–mass spectrometry in metabolomics and metabonomics". Journal of Pharmaceutical and Biomedical Analysis. 87: 12–25. doi:10.1016/j.jpba.2013.06.032. ISSN 0731-7085. PMID 23916607. ^ Stobiecki, M.; Skirycz, A.; Kerhoas, L.; Kachlicki, P.; Muth, D.; Einhorn, J.; Mueller-Roeber, B. (2006). "Profiling of phenolic glycosidic conjugates in leaves of Arabidopsis thaliana using LC/MS". Metabolomics. 2 (4): 197–219. doi:10.1007/s11306-006-0031-5. ^ Jorge, Tiago F.; Rodrigues, João A.; Caldana, Camila; Schmidt, Romy; van Dongen, Joost T.; Thomas-Oates, Jane; António, Carla (2016-09-01). "Mass spectrometry-based plant metabolomics: Metabolite responses to abiotic stress". Mass Spectrometry Reviews. 35 (5): 620–649. Bibcode:2016MSRv...35..620J. doi:10.1002/mas.21449. ISSN 1098-2787. PMID 25589422. ^ Tolstikov, Vladimir V.; Fiehn, Oliver (2002). "Analysis of Highly Polar Compounds of Plant Origin: Combination of Hydrophilic Interaction Chromatography and Electrospray Ion Trap Mass Spectrometry". Analytical Biochemistry. 301 (2): 298–307. doi:10.1006/abio.2001.5513. PMID 11814300. ^ Antonio, Carla; Larson, Tony; Gilday, Alison; Graham, Ian; Bergström, Ed; Thomas-Oates, Jane (2008). "Hydrophilic interaction chromatography/electrospray mass spectrometry analysis of carbohydrate-related metabolites fromArabidopsis thaliana leaf tissue". Rapid Communications in Mass Spectrometry. 22 (9): 1399–1407. doi:10.1002/rcm.3519. PMID 18384194. ^ Lee, Mike S.; Kerns, Edward H. (1999). "LC/MS applications in drug development". Mass Spectrometry Reviews. 18 (3–4): 187–279. Bibcode:1999MSRv...18..187L. doi:10.1002/(SICI)1098-2787(1999)18:3/4<187::AID-MAS2>3.0.CO;2-K. PMID 10568041. Thurman, E. M.; Ferrer, Imma (2003). Liquid chromatography/mass spectrometry, MS/MS and time of flight MS: analysis of emerging contaminants. Columbus, OH: American Chemical Society. ISBN 978-0-8412-3825-1. Ferrer, Imma; Thurman, E. M. (2009). Liquid chromatography-Time of Flight Mass Spectrometry: Principles, Tools and Applications for Accurate Mass Analysis. New York, NJ: Wiley. ISBN 978-0-470-13797-0. McMaster, Marvin C. (2005). LC/MS: a practical user's guide. New York: John Wiley. ISBN 978-0-471-65531-2. Yergey, Alfred L. (1990). Liquid chromatography/mass spectrometry: techniques and applications. New York: Plenum Press. ISBN 978-0-306-43186-9.